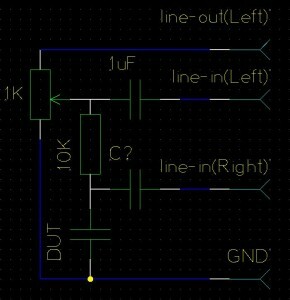 As an application of the FFT algorithms I present here a simple RLC meter that is able to measure resistors, inductors, capacitors with a reasonable precision. It uses a simple circuit in which a known frequency is sent to a R+Z circuit (where Z could be R, L, C) and then the current and voltage on the Z are measured. The current is indirectly measured by actually measuring the voltage on R.
A PC sound card is used to output the test signal on line-out and also to do acquisition of the measurement signals through line-in. Two frequencies are used, a low one and a high one for cases where Z is too low or to high. A calibration is performed with DUT (Device Under Test) unplugged. 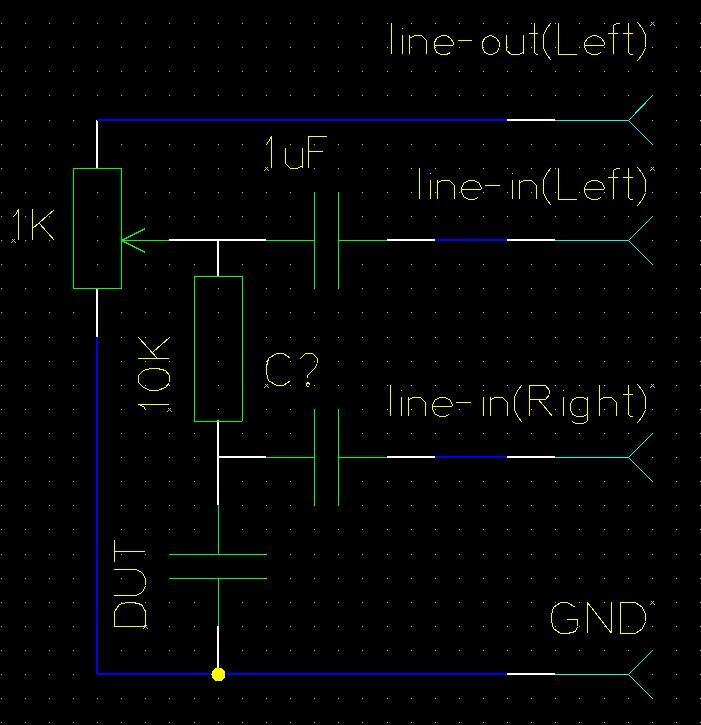 It will measure the impedance of the circuit and use it subsequently to adjust the DUT measurement. The time domain signals acquired from the sound card are transformed into frequency domain using FFT and so they become complex signals. Then you could do calculus using DC current methods. , where is the sampling rate. Now you could determine whether the DUT is R, L, C based on . The program runs on Linux with ALSA, alsa-utils, fftw installed. Source code is distributed under GNU GPL public license and can be downloaded from RLC meter source code. As I told last time, I’m going to present a small project I’ve done to exercise sound card use on Linux, sound processing with Fourier transform, Discrete Fourier Transform(DFT) and Fast Fourier Transform (FFT). All of these are used to make a practical LRC-meter able to measure inductors, resistors, capacitors. It is not the idea of this article to present the full math theory behind Fourier transform but only to present the application of the theory. Good books that present theory in detail are on the market, e.g. “Discrete-time signal processing” by Oppenheim and Schafer. The above formula is an analysis formula. A Fourier transform translates the signal from time domain to frequency domain in which it represents the signal as a superposition of sine waves each having a coeficient given by the Fourier transform. For LTI system: where h[k] is the impulse response of the system to unit step. meaning that the frequency response of a LTI system is the Fourier transform of impulse response. The Fourier transform formula of a discrete signal gives a continue function. Depending on the signal, the sum could be calculated easily or not because of the infinite number of harmonics taken into consideration. The Fourier representation in this case is a superposition of complex exponentials with frequencies that are multiple of fundamental frequency . Therefore, one could calculate direct/inverse DFT series easily by using a finite length N vector of respective . To calculate DFT with equations above you’ll have complexity . It is called FFT, the algorithms that strives to calculate DFT efficiently other than doing the sums above. There are couple such algorithms variations that goes to a complexity of .